In the middle of the nineteenth century there was a flurry of railway building in this area and there was something unique or curious about each new development. The main line was that from London to Windsor via Richmond and this was owned by the London and South Western Railway Company. In 1859 this company sought powers to build an extension or loop from the main line at Twickenham into Kingston. 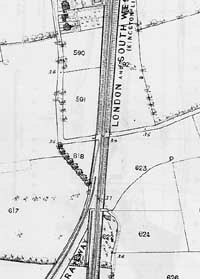 The loop was to be known as the Kingston Bridge Line. 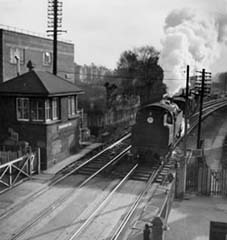 However a great deal of opposition was built up in Kingston amongst those with vested interests in the coaching trade and initially the line stopped at Hampton Wick. In contrast, the shopkeepers and property speculators of Twickenham and Richmond very much wanted the line to be built, their influence was apparently greater than that o f the opposition in Kingston and a further Railway Act in 1860 allowed the railway over the river and into Kingston. At about the same time another company was formed and took the name of the Thames Valley Railway Company, its object being to link Shepperton with Twickenham. With major works already in hand between Twickenham and Hampton, it seemed only logical for the London and South Western Railway to take an interest in the Thames Valley Railway and, by the Thames Valley Act of 1862, an amalgamation was agreed whereby the shareholders of the smaller company were suitably compensated and the London and South Western Railway bought out, constructed and operated the Thames Valley Railway. 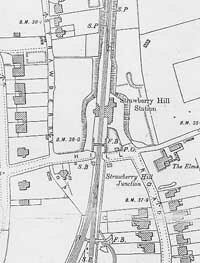 A glance at the Ordnance Survey Map for 1862 shows at once the absence of any station at Strawberry Hill and, of course, passengers from Shepperton journeyed through the junction with the Kingston Bridge Line and alighted at Twickenham Station. On the similar sheet for the 1898 survey the station at Strawberry Hill is clearly shown as are numerous houses and newly constructed residential roads. In fact the station was built and opened in 1873 and became the subject of numerous articles in the local press including the newly founded Richmond and Twickenham Times. The intriguing question is why it wasn't thought necessary to build a station from the beginning of the railway? Unfortunately, it will probably never be possible for an authoritative answer to be given for the one certain source of information ~ the Directors' Minutes of the London and South Western Railway for the relevant decade ~ was destroyed during the 1940 blitz on London by a fire at Waterloo station. There are two explanations which have been proposed over a number of years and, while they each have their own supporters, they are not necessarily exclusive of each other. One, is that the station was built at the behest of Lady Frances Waldegrave to ease the travelling for the many house guests she entertained at Strawberry Hill. A more likely explanation of the chief reason for the opening of the station is that pressure was exerted on the railway directors by property speculators amongst whom was the Rt. Hon. Chichester Fortescue, fourth husband of Frances Waldegrave. Again there is no direct evidence but, in the absence of the critical railway records, an intelligent guess can be made from other sources, particularly the files of the local newspapers. Fortescue was one of the property developers as can be seen from the rows of Victorian villas surrounding the Waldegrave estate and clearly it would be easier to sell the properties with the added convenience of a nearby station with good links to London.